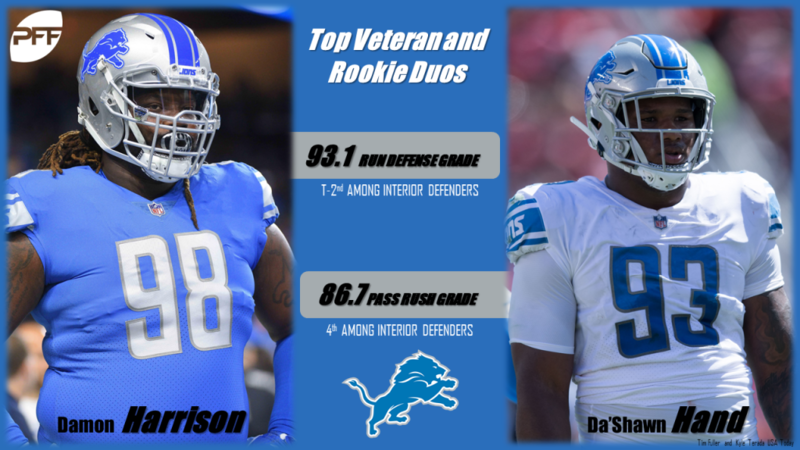 Now through Week 9 of the 2018 NFL season, we’ve decided to highlight the league’s best veteran-rookie tandems in terms of overall grades and production. Staley has been a rock on the 49ers’ offensive line since entering the league in 2007. In recent seasons, he has been truly elite. Since 2012, only Anthony Castonzo has played more regular season snaps at left tackle than Staley’s 6,028, and only Joe Thomas has graded better than Staley’s overall grade of 94.2 over that span. This season, once again, Staley has performed in the upper tier of the league’s left tackles, with an overall grade that ranks sixth at the position. He has allowed pressure on just 4.7 percent of his pass-blocking snaps, which falls inside the top-10 at the position this season. The 49ers went out this offseason and took the first tackle off the board in this year’s draft to bookend with Staley on the offensive line. 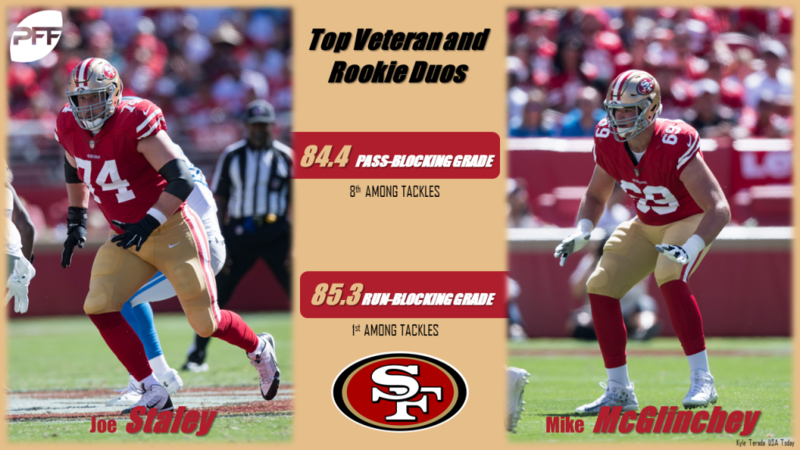 McGlinchey has certainly delivered, and he appears to be primed to lead the next decade in the trenches in San Francisco. Not only is McGlinchey’s 79.4 overall grade the highest of any rookie offensive lineman this season, but it is the highest of any rookie offensive player that has played at least 200 snaps. He has been a force in a running game that has averaged over 2.0 rushing yards per attempt before the running back is even contacted. McGlinchey’s run-blocking grade of 85.3 is higher than any other tackle in the NFL. For as long as Staley continues to play, the 49ers will have one of the top tackle pairings in the league. Jones finally found paydirt for the first time in a long time this Sunday, but touchdowns aside, his production over the last five years has been remarkable. Here at PFF, we track the receiving yards that a receiver records per route that they run, which is one of the stronger ways to measure their efficiency. Jones ranks first in yards per route run in four of the last five seasons, and he currently sits atop the metric this season. Simply put, when it comes to turning his routes into on-field production, there is no one better than Jones. That has translated to Jones either being tied for the lead or in sole possession of the top overall grade each of the last three seasons. Now defenses have a new name to worry about running opposite of Jones for the Falcons’ offense. Ridley has exploded onto the scene with seven receiving touchdowns thus far, which ranks tied for second in the league behind only Antonio Brown among wide receivers. Ridley has been deadly on two routes this season – the slant route and the go route. Between them, he has been targeted 14 times, which has led to 12 completions, 251 yards and six touchdowns. As Ridley continues to develop, the Falcons could soon have one of the top wide receiver duos in the NFL on their hands. All of these pairings are new considering one player is a rookie, but this pairing has only been on the field for two games together after Harrison was traded to the Lions prior to the trade deadline. His arrival gives the Lions the best run-stuffer that the NFL has seen in recent years. Harrison hasn’t earned a run-defense grade below 87.0 since his rookie season, and he led all interior defenders in run-stop percentage from 2014-2017. This year, he once again sits atop those lists with a 93.1 run-defense grade and a massive 10 run stops in just two games for the Lions. Meanwhile, Hand just strengthens that interior of the Lions’ defensive line with solid play in run-defense and pass-rush. Hand’s overall grade this season of 87.3 is atop all rookie players in the league and ranks 10th among all interior defenders. He has been solid in run defense, but his strength so far has been getting after the quarterback, which complements Harrison’s skillset nicely. Hand has only seen 152 pass-rush snaps this year, but he has made the most of them with 19 pressures for a pressure rate of 12.5 percent which ranks eighth at the position. The additions of Harrison and Hand make the Lions’ defensive line much improved and a unit to watch moving forward. The back end of the Texans’ secondary is another situation in which both sides of the pairing are newcomers. Mathieu came to Houston following an end to his stint with the Arizona Cardinals that did not quite live up to the expectations he had set following his first few years in the NFL. The Honey Badger has been a welcome addition to the Texans’ secondary, though, with an overall grade that ranks in the top-20 of all safeties. His versatility has been on full display, as he has been moved around the secondary, playing over 150 snaps in the box, at free safety and in a slot corner position. Reid, on the other hand, has played most of his snaps deep at free safety, and he has done a good job in his rookie season in that role for the Texans. His overall grade this year of 74.8 ranks 23rd among safeties with at least 200 snaps. Where he has really excelled through the first nine weeks of the season has been in the tackling department. Reid is the only safety in the NFL this season with 40 or more tackling opportunities and no missed tackles. The additions of both him and Mathieu have helped bolster the secondary on a Texans’ team that is surging with six straight wins heading into their bye.